There hasn't been a great amount on the club front. Bridget Delaney's The Burgess Story: A GAA History, was mentioned last year but came too late for review. It's a massive tome of over seven hundred pages and is lavishly illustrated, especially in the later period. Some would say rather too much for a club that isn't far up the ladder of precedence in the county, but that is to forget the role of the GAA in small parishes like Burgess. The GAA is more than a sporting organisation. It is firmly rooted in the life of the parish, giving expression to a people who would otherwise lack it. It touches everyone in the parish. Bridget Delaney recognises this in her book. As Gerry Slevin states it in his introduction: "Bridget realises the link there is between the parish and the GAA and the end product of her mammoth work provides us with an in-depth look at the life of her native parish, the GAA's influence on it and, in turn, the response of the parish to the way in which the GAA influence has seeped through it". As well as a writer, Bridget Delaney is a photographer and this is another strength of the book. In the opening chapter which gives an account of the history of the parish, she includes photographs of views and scenes, holy wells and graveyards, churches and historic remains in the parish. This visual account of what is to be found in the parish of Burgess brings the place to life in a way that the written word could not. The pictures continue all through the book. - The Story of a Tipperary Parish, which was launched at the end of October. Stretching to three volumes, about 1600 A4 size pages, at least one million words and over 2000 illustrations, the work is a mammoth production, the fruits of ten years of persistence and commitment from a dedicated history committee. It's a credit to the people involved and to the parish. "Long before the Gaelic revival began in the last two decades of the 19th century, the parish of Mayne and Templetuohy enjoyed a great diversity of sporting activity. Not all the sports that were played would have found favour with the founding fathers of the GM Archbishop Croke had deplored the 'putting on, with England's stuffs and broadcloths, her masher habits and such effeminate follies as she may recommend.' Such 'effeminate follies' as tennis, hockey and cricket existed side by side with the national pastimes of hurling, football and athletics in the parish and centred largely on the Big House at Longorchard. Indeed the clash of civilisations that was in progress nationally appears to have been remote from the sporting life of Moyne and Templetuohy. The Power Lalors made no distinction between specifically 'English' pastimes and the native pastimes of hurling and athletics which, according to leaders of the Gaelic revival, were to be part of the process of de-anglicising Ireland". At Mayne 's Athletic Ground. The tradition continues with Aisling Maher taking a bronze medal in 2001 in the European Games Special Olympics. Tom Carroll of Moyneard played with Thurles in the first All-Ireland. Jack Quinn and his brother, Michael, were on the Rockwell College team that won the first Harty Cup final in 1918. Tom Butler captained Thurles CBS to victory in the 1950 Harty Cup final. The club was occasionally in trouble with the Mid and County boards. In the early 1950s both the footballers and the hurlers got into trouble for actions on the field of play. The author quotes from a Tipperary Star reporter: "As an exhibition of hurling this game was a thing of 'shreds and patches' devoid of any vestige of merit ". The great county senior hurling final triumph of 1971 gets comprehensive coverage and the account includes the song that was composed in honour of the famous victory: "Then hurrah for Moyne and 'Tuohy/ Our great hurlers one and all". of the hurling and football clubs in 1991, dragged on for years. Willie Butler deals with them all in an impartial manner. In fact his account is eminently readable with the introduction of appropriate quotations from contemporary accounts, which add to the flavour of the work. Probably the best book of the year, and the best hurling book for a long time, is Hooked by Justin McCarthy, which was published by Gill and Macmillan and launched at Cork in April. Written in conjunction with Kieran Shannon, it runs to 246 pages and retails for €14.95. It is an engrossing autobiography of a man, who is steeped in hurling and has a rich tapestry of hurl ng experience to draw on, not only in club and in county, but outside Cork as well. Passionately committed to the game and immensely well informed on hurling in all its aspects, it's a wonderful production. What gives the book its particular attraction is the personal story that is told through its pages with a directness and a total absence of false modesty or any kind of coyness. The whole story is informed with a passion and self belief that in others might appear a case of hubris but in McCarthy 's case, is substantiated by his record. McCarthy is an original thinker on the game. One commentator has described the book thus: " It is a life of achievement and vaulting ambition, of conflicts and controversies and a relationship with the game which borrows something from passion, something from fanaticism. In hurling McCarthy has been all things and it has been all things to him". What gives zest to the pages is the account of McCarthy's fraught relationship with the Cork county board and its most influential figure, Frank Murphy. Over the years McCarthy has been disliked and distrusted by the establishment in Cork. He was an independent thinker, who was not afraid to speak his mind. The book reads wonderfully well, Shannon 's ghost writing perfectly matching the outpourings of McCarthy's memory, and is divided into thirty chapters, each of which reads as an entity in itself but also contributes to the overall effect of a wonderful book. A splendid book is Munster Hurling Legends by Eamonn Sweeney. Published by the O' Brien Press for €20, this book has to be a winner. Covering seven decades of the greatest teams, players and games in Munster since the thirties, it have excellent evocative pictures, which capture an era of hurling life in the province that seems a long time past. The book would live for the pictures alone. The very first one of the spectators at the 1934 Munster semi-final at Thurles, a predominantly male body with heads covered in hats, caps, handkerchiefs and newspapers, and not a flag in sight, is totally removed from today's crowd. The book is divided into ten chapters with each chapter highlighted by the greatest player from that period, Mick Mackey, Jack Lynch, John Doyle, Christy Ring, etc. The author writes on the GAA for the Cork Examiner and is a broadcaster also. A number of other books of national interest have hit the shelves for the Christmas market. Many readers may have listened to the RTE radio series, Hurling's Top 20, by Colm Keane, who is a senior producer with the station. Inevitably a book to go with the series has been published, in this case by Mainstream Publishing, Edinburgh. The book contains profiles of twenty hurlers from Jack Lynch to DJ Carey told through conversations with the players, with linking passages. The highlights of the player's career and an account of his achievements are included. The profiles run to about ten pages each and are written in a lively manner. Tipperary get a good number of entries, with profiles of Tony Reddin, John Doyle, Jimmy Doyle and Nicky English. Cork also get four in Jack Lynch, Christy Ring, Ray Cummins and Jimmy Barry-Murphy. Kilkenn y have three, Eddie Keher, Noel Skehan and DJ Carey, Wexford two, Billy Rackard and Tony Doran, Waterford two, John Keane and Tom Cheasty, Offaly two, Joe Dooley and Brian Whelahan, and Limerick, Clare and Galway have one each, Mick Mackey, Jimmy Smyth and Joe Cooney, respectively. The author admits there are no definitive measuring devices for establishing the credentials of legendary hurling stars. He goes on to outline some simple measures for establishing greatness in sport: "exceptional skills, ability to take control and to influence the outcome of events, strength on the playing field, unselfishness, longevity in the game and concern for fellow players all form part of the test". Ultimately, however, he admits that the selection he has made is a subjective one even if it has been informed by hundreds of conversations with former and current players. (The book costs €12.99). Brendan Fullam has been writing interesting hurling books for quite some time and his current one is called Captains of the Ash, which was launched in the Newpark Hotel, Kilkenny on November 11. Published by Merlin-Wolfhound Press it retails for €15. The book, which covers 320 pages includes profiles of seventy-seven personalities, including six from the field of camogie, every one of whom was the captain of a team, mostly of All Ireland teams. Not every All-Ireland winning captain has been included as some have already been cove red in earlier books by Fullam. The breakdown by county is as follows: Kilkenny have fourteen, including Andy Comerford; Tipperary have thirteen , going back as far as Jim Stapleton: in fact the back dust cover of the book has a fine photograph of Michael Murphy, the 1964 captain, leading out his men against Clare in the 1964 Munster championship; Cork also have thirteen, Limerick eight, Wexford 7, Dublin 5, Waterford, Galway, Offaly and Clare three each, Antrim two , and London and Kerry one each. As well as text the book includes over eighty photograph s. Anyone who is familiar with the quality of Fullam's work will put this book in the 'must buy' category. 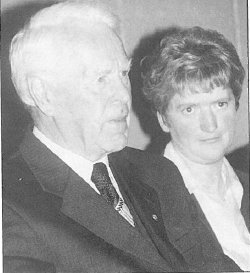 the National Leagues in hurling and football , 1926-2002, and every Gael will thank him for his research and his effort. Stretching to 416 pages and published by the Collins Press, Cork in flexi paperback, the book retails at the very reasonable price of €17.95. In 1926 Cork hurlers and Laois footballers won the first ever national league titles. Since then all thirty-two counties, plus New York, have played in either a league semi-final or final. Starting with the first finals the book gives an account of over 180 games, the line-out of the finalists and, where possible, a photograph of the winning team. This latter point is a tremendous strength of the book and a tribute to the research of the author. Where the photograph of the winning team was not available, the author uses a photograph of the county panel from the year. The format of the book is good, divided into chapters according to decades. Each final is given two pages which includes an account of the game, the line-outs of the finalists and the photograph of the winning side. The book concludes with the roll of honour in both leagues. Kerry lead with sixteen victories in football , followed by Mayo with eleven. Interestingly New York have three finals to their credit, 1950, 1964, 1967. In all sixteen, including New York, counties have won football titles. Tipperary head the table in hurling with eighteen victories, followed by Cork with fourteen. Ten counties have won hurling titles. Tipperary's John Doyle, with eleven medals, is the holder of the greatest number of individual titles. An unusual publication is a short memoir by Alf MacLochlainn entitled From Tipperary to Joseph's Prairie: the story of Joseph Ryan, the Seventh Man in Hayes's Hotel. Containing twenty-four pages it is a limited edition of 150 copies and sells at €5. It is available at Eason's in Clonmel and Lar na Pairce. soul of the party in a small town on the Canadian frontier". His grand-daughter is married to the author of this memoir. Ryan was born at Carrick-on-Suir in 1857 and died at Cranbrook, British Columbia, Canada in 1918. John Scally, who wrote Raising the Banner, has a new publication. Sporting Foot and Mouth is a book of sporting quotes, many of them from the world of the GAA. Published by Blackwater Press, it sells for €12.99. It contains some funny quotes from commentaries from Micheal O Muircheartaigh, including the one about Pat Fox and the dog. Some of the quotes are apocryphal but that makes the book all the better. It's about time somebody wrote about Sean Boylan. The Boylan Years: One Man, One Team, Twenty Years is edited by Liam Hayes and looks at the career of Boylan as Meath football manager. It is based on interviews with over fifty players spanning Boylan's long-running tenure. Boylan won more than any other contemporary manager except Mick O'Dwyer. His haul includes four All lrelands, three NFL and eight Leinster titles. He was named Manager of the Year in 1999. The book is published by Carr and Hayes, the publishing firm of Liam Hayes and Tommy Carr, and sells for €25.99. My final book would probably not be used for bedside reading, unless, of course, one were suffering from insomnia. Strategic Review: Enhancing Community Identity, published by Costar Association with no price attached, runs to 264 pages. It is the result of a detailed analysis of the present stage of the GAA and a series of recommendations on how it should face the future. As this is being written the 'Strategic Review' is being discussed and debated in GAA circles up and down the country, and the debate culminated on the weekend of October 25/26. Unfortunately for the future of the organisation virtually every recommendation of substance was thrown out, referred to the implementation committee or just wearily withdrawn by the advocates, who included three of the last four presidents of the Association, Peter Quinn, Joe McDonagh and in incumbent, Sean McCague.